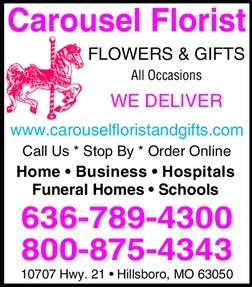 At CAROUSEL FLORIST, We Make Every Occasion Special Just For You! Family owned and operated since 1990, we're a local Hillsboro, Missouri florist delivering courteous, professional service and the highest quality floral and gift items around. Our designers can create floral arrangements that will complement any occasion and meet your budget and style expectations as well. We also offer daily delivery service to all local funeral homes and hospitals. Creating Thoughtful Memories, One Flower at a Time! Call or stop by our shop in Hillsboro. Choose from our nice selection of Green Plants, Blooming Plants, Dish Gardens, Fruit Baskets, Gourmet Baskets, Gift Baskets, Baby Gifts, Candy, Greeting Cards, Home Decor, Scented Candles, Silk Flowers, Plush Stuffed Animals and more! Our beautiful selection of high-quality flowers and eye-catching design styles are sure to bring rave reviews on your wedding day or at any festive occasion - large or small. Whatever the event, it is our pleasure to deliver the most beautiful floral bouquets to enhance the moment. Call our shop in advance at 636-789-4300 to schedule your consultation. 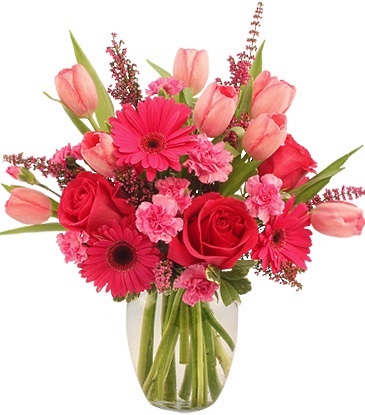 Thank you for visiting our website for flowers delivered fresh from a local Hillsboro, MO florist, Carousel Florist.